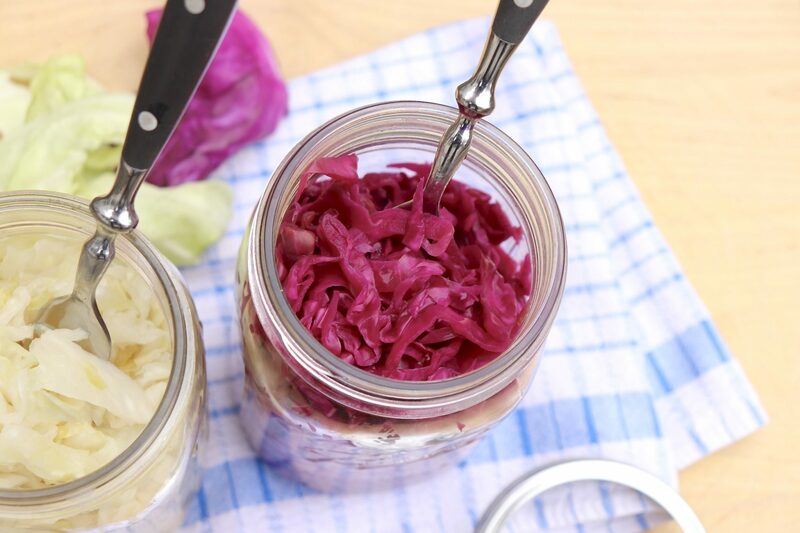 2-ingredient homemade sauerkraut is loaded with gut-healthy probiotics and incredibly easy to make thanks to these step-by-step instructions. If pork & sauerkraut is part of your New Year’s Day tradition, you’re in luck! I wear many hats in my role of food writer and recipe development. Writing, photography, editing, managing a website, the proverbial “paperwork” － and lots and lots of cooking, of course. One particularly fulfilling extension of my job is volunteering with school groups. Recently, I partnered with environmentalist Lisa Sanchez for a daylong event teaching high school students the finer points of preserving food. We canned, dried and pickled － and did some basic roasting, steaming and pressure cooking, too. It was a full day and the students were incredibly engaging. Because tasting is always fun, Lisa brought jar upon jar of foods she preserved － things like dehydrated tomatoes, bananas and apples, bread and butter pickles and kale chips. Zucchini gummies were, without a doubt, the most original. For those who may be wondering about that last item, Lisa simmers zucchini slices in grape juice and then dehydrates them. The end result looks and tastes nothing like zucchini － and for the record, they were delicious! Another surprise was Lisa’s sauerkraut. 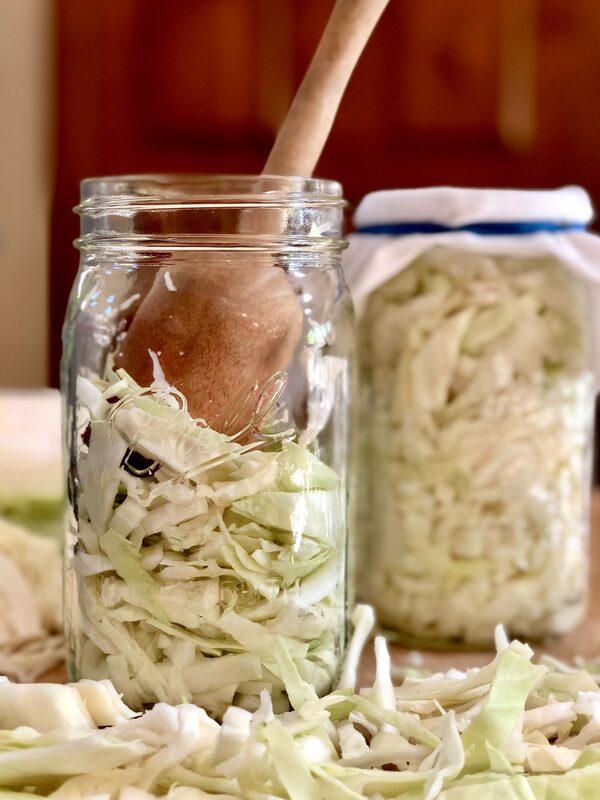 She ferments cabbage using a very simple process and the result is crisper and more flavorful than most any sauerkraut I’ve tried. I enjoyed her version served cold, like a crisp salad, and many of the students reported they liked it far more than the canned version they usually eat. The prep time is minimal and involves slicing and salting fresh cabbage. Then you wait for 3 to 14 days, or until the flavor suits you. If you’d like to try this for a traditional New Year’s Day meal of pork and sauerkraut, you have plenty of time. Once the sauerkraut reaches your preferred level of tanginess, you simply refrigerate (which stops the fermenting process) until ready to eat. Shortly after tamping, the cabbage will begin to release its liquid.⇧⇧ By the second day, there should be enough brine to cover the cabbage. Once the sauerkraut is tangy enough for your liking, you can refrigerate and store (in the brine) or use it right away. I like to remove the kraut from the brine and enjoy as a crisp side dish or in sandwiches. Because fermentation is akin to a science project, there are some simple guidelines that should be followed. Lisa was kind enough to share her method, which she originally learned via The Farmer’s Almanac. Since we taught our seminar earlier this fall, I’ve made quite a few batches in my own kitchen, varying certain elements each time to see how the fermentation process would be affected, ultimately returning to her tried-and-true recipe. 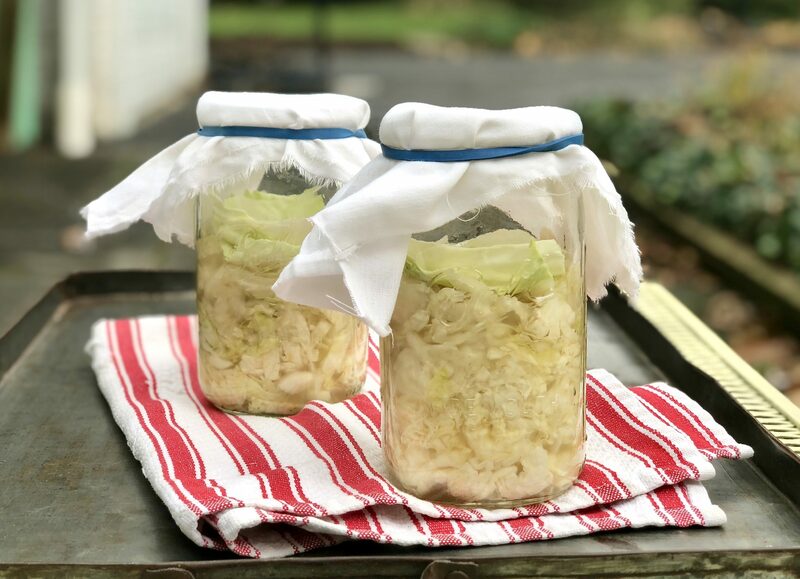 Cabbage and salt are cheap, so for a couple of dollars, the end result was sauerkraut loaded with healthy probiotics that would sell for top dollar at a specialty market and, thanks to Lisa’s method, offered a flavor and texture that rivaled the best of them. When you’re looking to create a scientific reaction (in this case, fermentation) with just two ingredients, it makes sense that the proper ratio of those two ingredients is important. I found a helpful writeup on salt as it pertains to making sauerkraut via Wellpreserved.ca and share the highlights below. Cabbage can be fermented without salt, but it tends to be less sour and its shelf life will be reduced. Too much salt will slow or prohibit fermentation altogether. In the first few days of the ferment, your product may taste overly salted. This will mellow as the fermentation process continues and more liquid is produced. Many sources, including the Lisa’s Farmer’s Almanac reference, recommend 3 tablespoons of salt per 5 pounds of cabbage. I’ve had success using 2 teaspoons per pound, which is a shade under that recommendation. I’ve stuck with the time-tested ratio in the recipe below, but this may afford some flexibility for those looking to reduce sodium in their diets as much as possible. Opt for the freshest cabbage that feels heavy for its size. This means there will be enough water in the cabbage to produce sufficient brine. Start with more cabbage than you need. Expect to discard several big exterior leaves because they’re wilted or otherwise in poor shape. The tough core will not be used either. The proper ratio of salt to cabbage is important, so if you don’t have a kitchen scale, weigh the cabbage at the store so you can get as close as possible to the desired amount. Short of a scale, aim for enough sliced cabbage to fill the desired jar size after fairly forceful tamping. 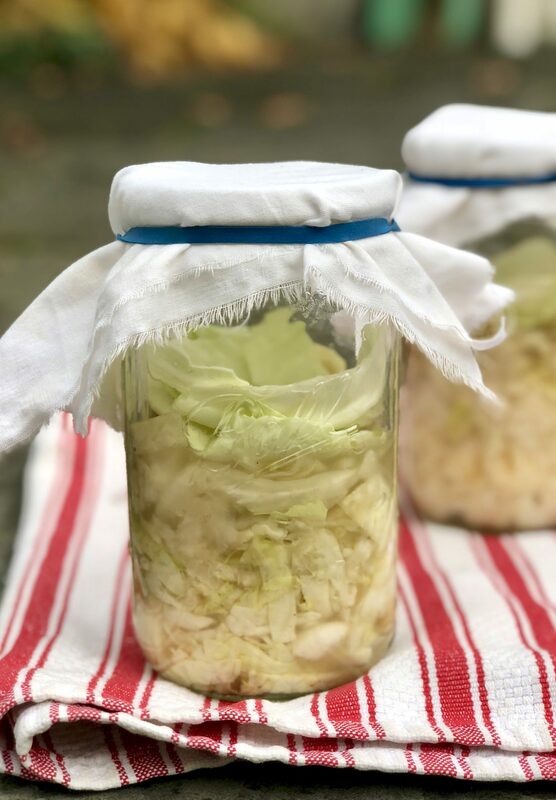 Packing the cabbage tightly in the jar creates a better environment for successful fermentation by any eliminating air pockets. Also make sure to remove and discard any blemished, bruised or otherwise discolored areas elsewhere in the head of cabbage, as these spots can lead to rotting which may taint the batch. The only time I had a batch fail was when I used a head of cabbage that had several brown spots throughout the interior. This head didn’t produce much brine (I had to add some) and even though I cut out the spotted areas, the batch began to discolor and spoil after 3‐4 days. My best guess is that the head had already begun to deteriorate before I started the fermentation process because it was old or perhaps not stored properly. If the cabbage and salt were weighed and measured properly and the flavor of salt is pervasive, this typically indicates that the cabbage needs to be fermented longer and/or the head of cabbage did not produce sufficient brine. Homemade sauerkraut tastes crisp and clean and can be enjoyed in the usual ways ﹣ like New Year’s Day pork & sauerkraut ﹣ or in sandwiches and as a healthy side dish. I use my grandmother’s old berry masher to tamp down the cabbage, but you can use a wooden spoon or one of the wooden hammers used to crack lobster and crabs. 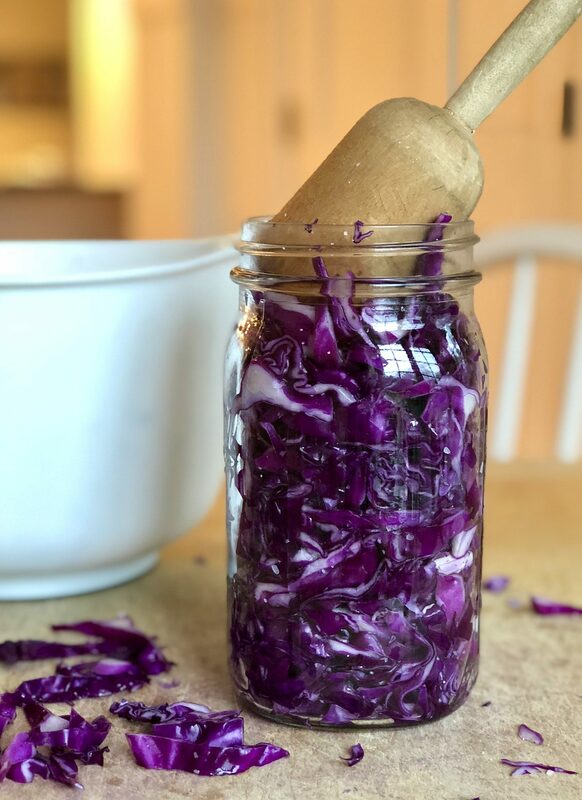 At first it will seem like there’s no way all the cabbage will fit in the designated jar size, but if you tamp as you go (and use some elbow!) it will. Any fresh cabbage cab be fermented. Notice the color dulls slightly during the process. Also, there is brine in the jar below, but I used the fork to “fluff up” the condensed cabbage and pull it up for the sake of the photo. For best storage, the sauerkraut should remain covered in brine. Yield: options given below; note that the cabbage will compact in the jar to about 2/3 to 3/4 of its initial quantity as it softens and releases its liquid, but since it’s so packed down, the yield will be greater than it may seem! Homemade sauerkraut tastes so much better than canned and is a breeze to make thanks to these step-by-step instructions. Clean everything: When fermenting anything, it’s best to give the good, beneficial bacteria every chance of succeeding by starting off with a clean an environment. Wash and rinse the jars of all soap residue and make sure your hands and work surface are clean. Salt the cabbage: Place the cabbage in a large bowl and sprinkle with the salt. This may not seem like a whole lot of salt at first, but it will give you a 2½ percent solution, the ideal strength for fermentation. Toss the cabbage with your clean hands for a minute or two, massaging/squeezing it lightly to allow the cabbage to start releasing water. 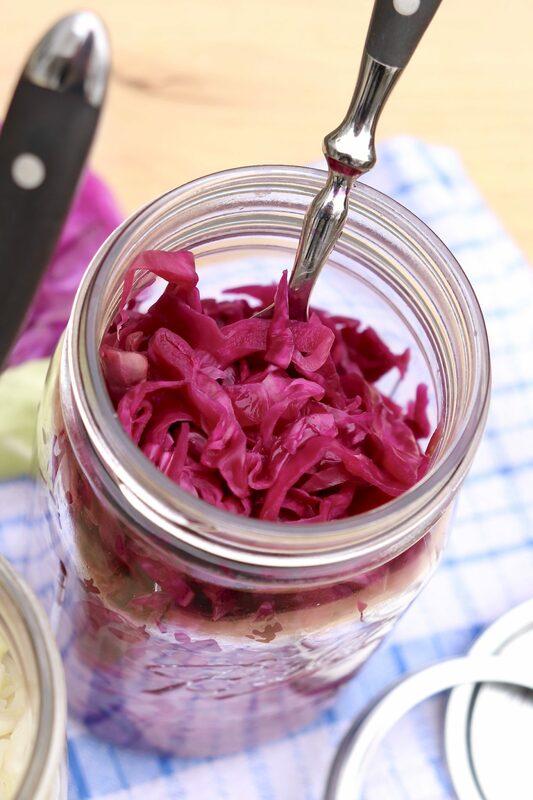 Pack the jar: Pack the cabbage in the jar, tamping as you go with a wooden spoon, crab mallet or potato masher to eliminate air pockets. (It’s okay to put some elbow into it to make it fit in the jar.) At first it should seem like there’s too much cabbage for the jar, but keep tamping. It will fit. Weigh down the cabbage: Once all the cabbage is packed into the jar, place a rolled up cabbage leaf, a clean stone or other weight on top to help keep the cabbage weighed down, and by the second day, fully submerged beneath its liquid. If using a crock with a wider opening, you can use a plate with a weight on top. You could even use a small, clean jar or a zip-top bag filled with water. Cover the jar: Cover the mouth of the jar with a clean cloth and secure it with a rubber band or string. This allows for some airflow in and out of the jar but prevents dust or insects from getting into the jar. 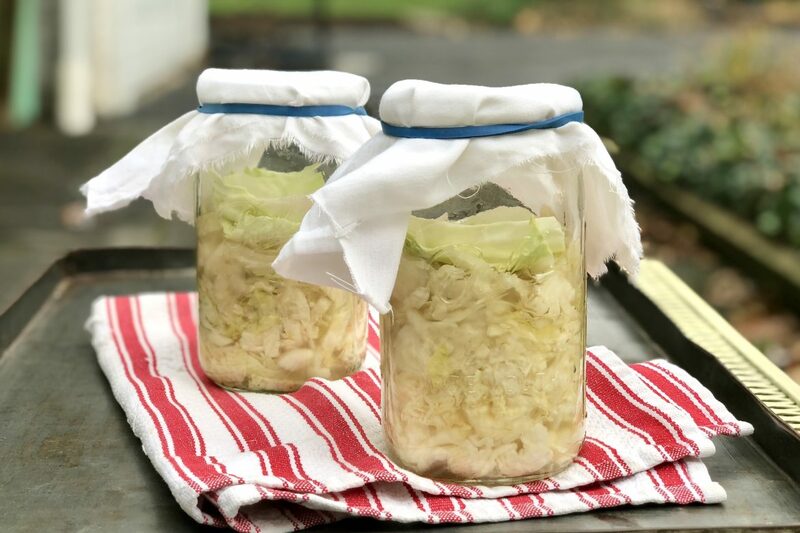 Ferment the cabbage for 3 to 14 days: During this time, keep the sauerkraut away from direct sunlight and at a cool room temperature (ideally 65°F to 75°F). Check it daily, pressing down if the cabbage is floating above the brine. Note that small batches will ferment more quickly than larger batches. Start tasting after 3 days, and when the sauerkraut tastes good to you, remove the extra cabbage leaf or weight, put the lid on the jar, and refrigerate. Refrigeration will stop the fermentation process. (If you used a crock for the fermentation process, you can transfer the sauerkraut, including the brine, to clean glass jars.) If you prefer a more pungent flavor, you can allow the sauerkraut to continue fermenting for longer than 14 days. There’s no set rule for when the sauerkraut is “done.” Just make sure it is always covered with brine and then let your taste buds decide! Storage: Fermentation creates a natural preservative effect, so the sauerkraut will keep in the fridge for 6 months to a year. If you have a cellar where the temperature is between 40°F to 50°F, you can store it there. Optionally, you could pack it in jars and process it – heat the sauerkraut just to simmering, pack in canning jars, seal, and process in a water bath 20 minutes for quarts, 15 minutes for pints. Do note that the heat will kill the beneficial bacteria created during the fermentation process. *Green cabbage is typical but any variety, including red and Napa, may be used. *The correct amount of cabbage is key to achieving the proper ratio of salt to cabbage. Weight is the most accurate way to measure the cabbage in this recipe. If you don’t have a kitchen scale, use the scale at the store, making sure to start with a 1/4 to 1/2 pound more than you need to account for the core wilted and exterior layers that you will peel away and discard. For each of the jar sizes, it should feel challenging to pack all the cabbage in at first. **If you substitute salt: Teaspoon for teaspoon, the difference between fine grain canning salt and coarser kosher salt equates to roughly 1/4 teaspoon. To see how important the type of salt is, I tested this recipe with similar measurements of kosher salt and slightly less canning salt. All batches were successful and the difference in taste was fairly small. (My only batch that failed was one where the cabbage was not particularly fresh and did not produce much natural brine.) 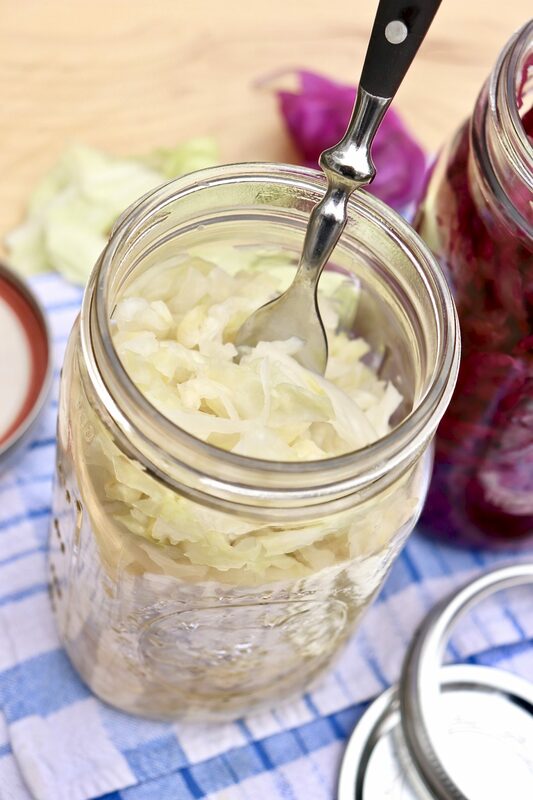 Tip: If you taste your sauerkraut and it seems too salty, it likely needs to ferment longer. 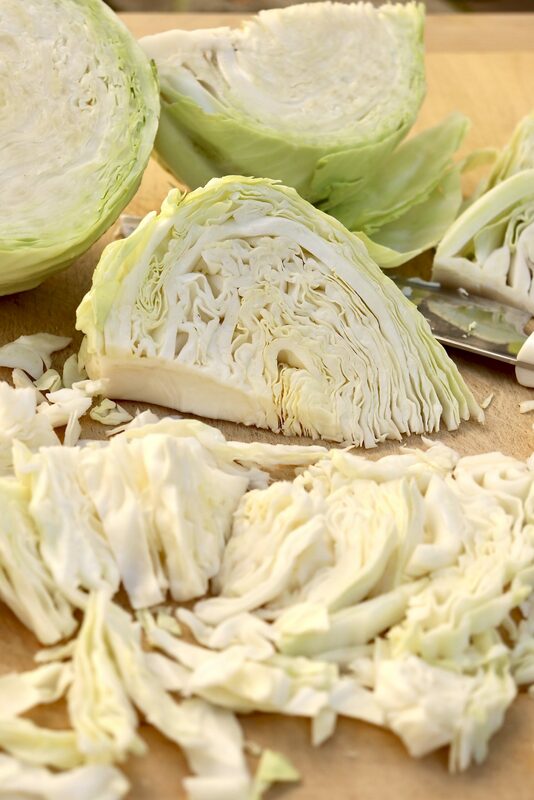 •If you used fresh and tender cabbage, by the second day you should have enough brine to cover the cabbage. If you don’t, make more brine by stirring 1 teaspoon of salt into 1 cup of water and add enough of this solution to cover the cabbage. •During the fermentation process, you may see bubbles or white scum on the top. These are signs of normal fermentation. Skim off any scum as you see it or prior to refrigerating. If you happen to see mold, get rid of it right away. You’ll want to discard any moldy cabbage near the surface, but the rest of the sauerkraut will be fine to eat. 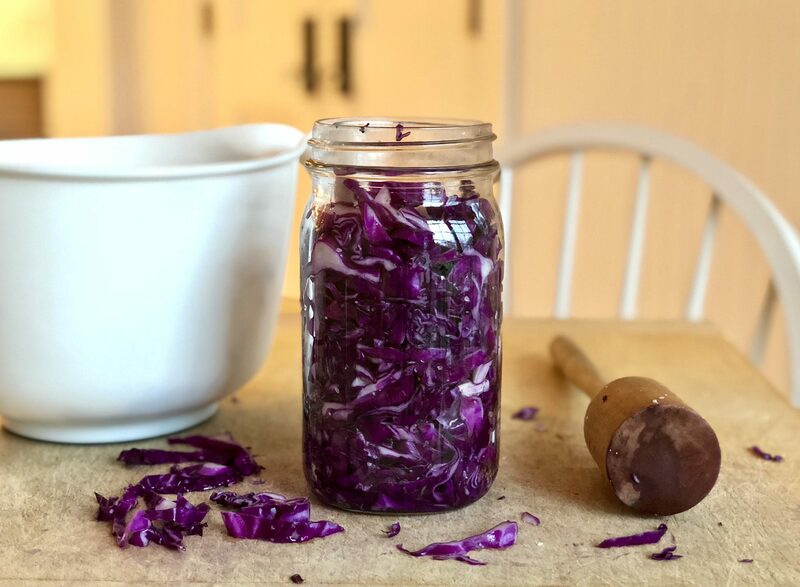 •Red, Napa, and other cabbages make fine sauerkraut, too, so you could experiment with different varieties or even mix them. I enjoy the barebones kraut, but you could play around with various pickling spices, peppercorns, etc. •Any quantity can be made. Simply follow the same guidelines and maintain the stated ratio of pickling salt to cabbage. •Keep your hands and any metal object out of the crock. Use wooden spoons and mashers and glass or crockery for dipping and weighting. HI Ann! I love sauerkraut! We have friends in our town that started a business a couple of years ago making fermented foods. They started with pickles and now make kraut, beets, and my favorite caulisprouts, which is a combo of cauliflower and brussels sprouts! It started small but they have expanded it and have commercial kitchen space. They both take yoga at the studio where I go and the yoga studio also sells it. Haha! Sauerkraut most definitely is one of those polarizing foods. It’s a New Year’s Day staple where I live, adored by many but not by all! Somehow making it into a bit of a science experiment adds to the appeal for me – and when I first tasted Lisa’s sauerkraut, it truly was absolutely my favorite of all time. I love that your friends made a business of it! Wonderful! I hope you enjoy it, Alicelynne! Hi Ann, what a great idea for the New Year! If you like sauerkraut, you might want to try my cabbage wedges that I ferment in a brine containing 11 grams (2 teaspoons) of sea salt per cup. I use a 2 quart fermentation jar, sprinkle the bottom with a tablespoon of mild red pepper flakes (pul biber) and a good teaspoon of cumin seeds, and sometimes a bay leaf or two. Then I pack as many cabbage wedges as possible into the jar, plus two or three garlic cloves, and add the water and salt cup by cup until the wedges are covered. I also use a pickling pebble to keep the kraut submerged. I’ve never had any problems with mould, and my kraut sits for three weeks . (btw: the thickest part of a wedge being about an inch thick). This makes for really crunchy kraut. I love that idea, Nadja! It sounds delicious with the cumin seeds, red pepper, etc. Thanks for mentioning the specifics for anyone who may like to try! I followed this method and it sure beats store-bought! Thank you! Wonderful, Gina. I’m delighted you like it! I never fermented or pickled until now, but this recipe seemed like an easy place to start. It turned out GREAT and I do like that this sauerkraut is crisper than store-bought and that I can stop the process before it gets too tangy. THANK YOU!!! My pleasure, Jane. I’m so glad it was a success! We had this for our New Year’s Day pork and sauerkraut yesterday and it was the best ever! Thanks so much. It was incredibly easy to make! Great news and Happy New Year, Marie!